This is a very charming traditional Tuscan farmhouse near Panzano in the heart of the beautiful Chianti Classico area, set in the 'Conca d'Oro' between Siena and Florence nearby the famous panoramic Chiantigiana route. The house is situated at the end of a path boarded by cypress trees and along which you'll find several farmhouses still belonging to the very ancient family property, some dating from the late middle ages. The property is surrounded by many acres of vine yards, olivetrees and 10 acres of forest. At one and a half km you'll find the cute little village with its newspapers, bank, grocery stores and restaurants and with its casle and very old Roman church and with the famous butcher where people come from far to taste the great sandwiches prepared on the spot. You're only at 6km from Greve in Chianti and many other famous spots, the Tuscan experience can't be missed from this position since you're right in the middle of it all; the food, the wine, the hills, the views and the culture all at hand. At 300m distance you can use the pool at the neighbors! 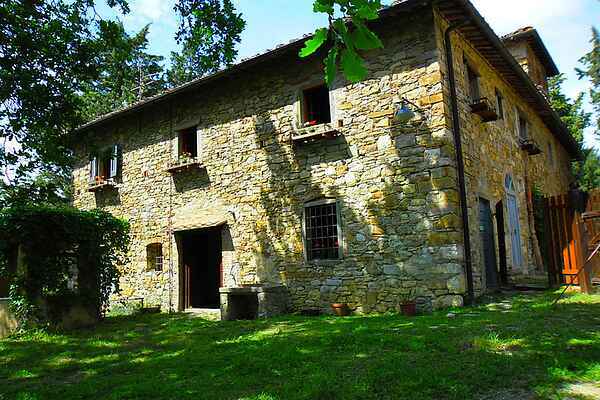 This is a very charming traditional Tuscan farmhouse near Panzano in the heart of the beautiful Chianti Classico area, set in the 'Conca d'Oro' between Siena and Florence nearby the famous panoramic Chiantigiana route. The house is situated at the end of a path boarded by cypres trees and along which you'll find several farmhouses still belonging to the very ancient family property, some dating from the late middle ages. The property is surrounded by many acres of vine yards, olivetrees and 10 acres of forest. At one and a half km you'll find the cute little village with its newspapers, bank, grocery stores and restaurants and with its casle and very old Roman church and with the famous butcher where people come from far to taste the great sandwiches prepared on the spot. You're only at 6km from Greve in Chianti and many other famous spots, the Tuscan experience can't be missed from this position since you're right in the middle of it all; the food, the wine, the hills, the views and the culture all at hand.